The U.S. military feels its experience fighting terrorists overseas can help Mexico in its fight against the drug cartels. 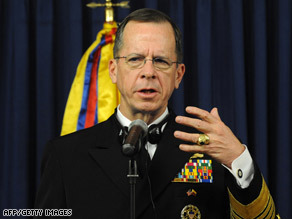 “There are an awful lot of similarities,” said Adm. Michael Mullen. Mullen, the chairman of the Joint Chiefs of Staff, spoke to reporters as he flew home from a weeklong visit to countries in Latin America, ending with Mexico on Friday. “The intelligence support capabilities, tactics that evolved for us in our fight against networks in the terrorist world bears a direct application,” Mullen said. “Certainly the kind of surveillance, reconnaissance doctrine that we use. And we’ve been working with them to cooperate with them as they’ve evolved. And they’re evolving pretty rapidly.” Mullen met with Mexico’s secretaries of defense and navy and spoke with cadets at the country’s naval war college. In Mexico, Mullen, the top uniformed official in the U.S. military, discussed how the United States can continue to provide military training, intelligence and equipment to help Mexico fight the cartels. The United States has committed $1.4 billion in assistance for the drug fight to be spent over three years, beginning last year. The new administration, Mullen said, would make decisions about assistance beyond that period. Mexico’s military and police have been involved in an increasingly violent confrontation with cartels. “It’s very evident President [Felipe ] Calderon has made, I believe, a courageous decision to really go after this,” Mullen said of Mexico’s efforts. “And that’s one of the reasons the violence level is so high.” Mullen said while the U.S. government is concerned about corruption and the leaking of information to cartels, it was clear from his meetings that the Calderon government is trying to deal with the problem. “The concern for that was very specifically expressed, and again I think the leadership in Mexico understands that and have taken steps to certainly minimize and/or eliminate it,” Mullen said. “They’re aware of the problem. Certainly we are, and given that I think that’s an important place to be.” Mullen’s trip also took him to Brazil, Chile, Peru and Colombia.